The all-new Ascent is what you'd expect from a 3-row Subaru SUV. It prioritizes comfort, quality, safety, and sportiness. Now, Subaru fans with growing families don't have to shop elsewhere, and buyers have an appealing new choice. The Subaru Ascent has the interior space, versatility and smart touches to compete with the Toyota Highlander, Nissan Pathfinder and Mazda CX-9. The Ascent has more than met our expectations for comfort and tow capability. We selected this car for the increased tow capacity over other truck like models to be able to tow a small trailer. The car is very comfortable and easy to adjust the seats with addition of heating and air conditioned seats in the Touring model. Handling and performance are very good. Would say only disappoints are the need to have app and service contract for the remote start feature, which was on the keyfob of our prior car. Also the collision warning for pulling into a parking space or clearing the corners of the car are not as helpful or sensitive as expected. A Bigger, Better, More Fun Subaru! 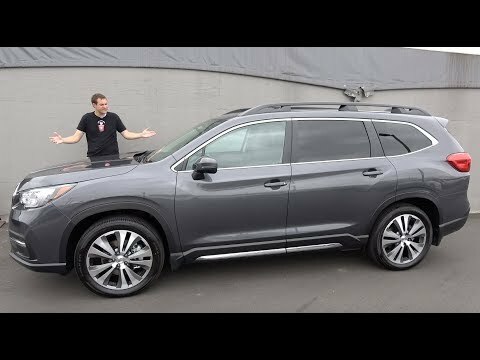 We've had our Subaru Ascent for about month; and the Assent is an amazing vehicle. It has everything our Forester had and more. Keyless operation, incredible space, 7 passenger seating, leather interior, and incredible dashboard, Bluetooth with hands free cell phone, multiple apps. We're still discovering things and loving every new item we find. It's huge, and it's got so many cup holders. Too bad those cupholders took away from other storage options. I wish the technology was a little more user friendly. Make it easier to turn off certain features quickly. For the most part, I do love this car. I just wish that the people who design the cars would actually drive them in real world scenarios to see what would be best for the driver.